A good site search enables a person to bypass the extraneous structure and content of a site and go directly to the desired content. The site search feature itself should be easy to find and simple to operate. An advanced or complex search form could be provided as an extra feature, but it should not be the default option. The search form should be readily distinguishable on the page, and differentiated from other forms by having a clearly labeled search text box and/or button. The site search feature is often most usable if it appears on every page, though there is no requirement that it do so. At the very least it should appear on the home page, without forcing users to click on a link to a search page. The search feature should have a character width of about 25 to 35 characters, so that users can type and edit their queries without too much difficulty. Site search can be marked up with the "search" ARIA landmark role (e.g., <form role="search">) to allow it to be more easily accessed by screen reader and keyboard users. This role differentiates the search form from all other forms on the page. Alphabetical site indexes list all of the important areas of content on a site in alphabetical order, much like the index at the back of a book. This may be unnecessary for very small sites, and may be impractical for very large sites, because these lists can become too lengthy to use effectively, but it is also one of the most useful ways for a user to find information on a site. 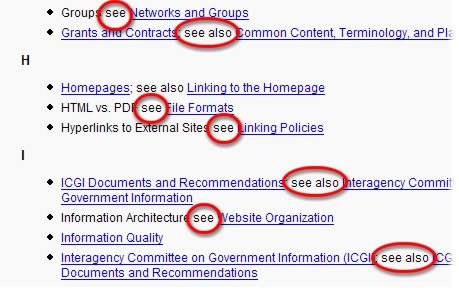 Well-designed alphabetical site indexes include synonyms of words and concepts that users may want to search for. For example, in a site about classical composers, alphabetical site indexes should account for the fact that users may try to find out information about the composer Claude Debussy by looking under the first name, last name, or even terms such as "French composers," "impressionistic music," or even the names of his compositions such as Claire de Lune or Reverie. The example below cross-references terminology about web technologies. The more comprehensive the alphabetical index, the more useful it is, as long as it does not become unwieldy. Developers may need to create multiple pages for long indexes, perhaps with a page for each letter of the alphabet. A structural site map is a list of links to the contents of a web site, organized by topic or category. Normally, structural site maps mirror the site's organization. For example, if a site has 3 main "tabs," or category links at the top of each page, these 3 categories could serve as the method for organizing the content of the structural site map. In general, the site map organization should reflect some navigation or structural organization of the site itself. The above example is probably overly simplistic, but the idea would be the same for more complex sites. However, one problem with graphical site maps for complex sites is that they would need large structural maps—perhaps larger than could be easily understood. There are many ways of representing a site's organization graphically. Photos or graphics could be used in the headings to group and illustrate concepts. Circles or boxes could be drawn around related pages. A furniture store could use a floor plan of a house to organize the names or photos of different types of furniture. All of the links to kitchen items could literally be placed in the diagram's kitchen, and so on. This type of concept can be quite powerful when used carefully and when tested for usability. The creativity involved in thinking up ideas such as this can easily backfire though, creating a confusing mess. Be creative, but test solutions to ensure they work. Graphical site maps are probably unnecessary if the visual design of the site navigation provides obvious visual cues as to the structure of the entire site. Another primary issue is screen reader accessibility. It would be unfeasible and unusable for such a graphical site map image to be given adequately descriptive alternative text. If used, other mechanisms for providing access to the site structure may be necessary.